Actor Nawazuddin Siddiqui's much-talked about movie Babumoshai Bandookbaaz is all set to hit the theatres this Friday. Ahead of its release, the makers of the film unveiled a new poster of the movie. 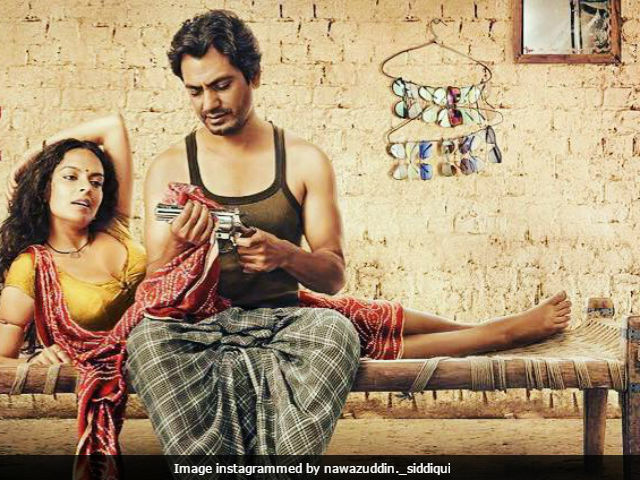 On the poster, Nawazuddin is seen sitting on a chaarpai along with Bidita Bag. He is seen cleaning a revolver while Bidita watches. The Freaky Ali actor shared the poster on his social media accounts with a caption that read, "Aa rahe hain milne 25 August ko. #4daysToGo for #BabumoshaiBandookbaaz @biditabag @babumoshaibandookbaaz." In the film, Nawazuddin features as a contract killer, who doesn't think twice before pressing the trigger of his revolver. Babumoshai Bandookbaaz has been directed by Kushan Nandy and co-produced by Kiran Shyam Shroff and Ashmith Kunder. The makers of Babumoshai Bandookbaaz unveiled the trailer of the film on July 12. Babumoshai Bandookbaaz also stars Divya Dutta, who features as a cop, Murli Sharma, Jatin Goswami, Shraddha Das, Anil George, Jeetu Shivhare and Bhagwan Tiwari. Nawazuddin has shot for intimate scenes for the first time in the film. In an earlier interview with news agency IANS, he said that he was ' quite nervous' during the filming. "Yes, I have done intimate scenes for the first time, so I was quite nervous to do such scenes. You feel good and nervous at the same time. It's not that fun when you are doing a scene. You focus on the scene and not on other things," IANS quoted Nawazuddin Siddiqui as saying. Babumoshai Bandookbaaz is scheduled to release in theatres on August 25 along with Sidharth Malhotra and Jacqueline Fernandez's A Gentleman.